I just made a bunch of cupcakes for Matt’s 30th birthday. I tried 2 new gourmet cupcake recipes that I found online and made snow white buttercream icing as well. I displayed half of them on a cupcake stand and the others on 2 of my late Grandmother’s crystal cake stands. They look fabulous! To top them off, I made these cute cupcake flags which feature phrases on them including, “Happy Birthday Matt!”, “You’re 30!! !”, “Sooo Tasty!”, etc. If my cupcakes are a hit tomorrow at our dinner party, maybe I will think about doing this as another random creative-job-o-mine. 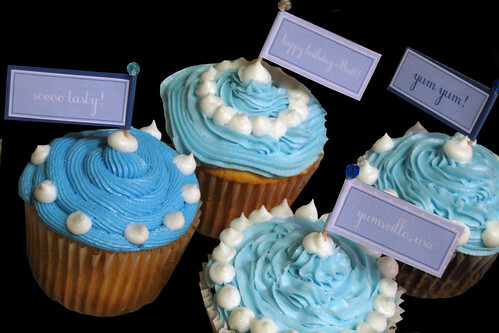 This type of thing would be perfect for birthdays, wedding and baby showers! Yum yum!